Bio-Q-Sorb® ActiveQ® is different – it is the ONLY 200mg Kaneka Ubiquinol Coq10 that is 100% Ubiquinol Coenzyme Q10! Bio-Q-Sorb® ActiveQ® uses Ubiquinol the “active” antioxidant form of Coenzyme Q10 and is now available in a new 200mg per softgel dosage. Most commercially available CoQ10 uses Ubiquinone -- the fully oxidized form of Coenzyme Q10. 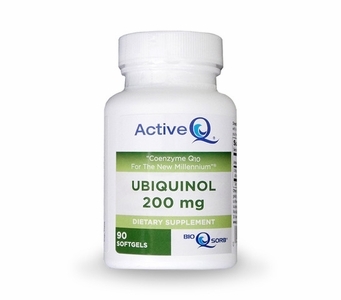 However, research, (in animals and humans), has shown Ubiquinol to be absorbed better than Ubiquinone in fact, more than 90% of the circulating CoQ10 in our body is present as Ubiquinol. Why weren’t Ubiquinol soft gels as available as the Ubiquinone form of CoQ10 in a soft gel? The problem was stability and it was only recently solved by Kaneka Corp of Japan. That breakthrough solution Kaneka Ubiquinol is now utilized in the new Bio QSorb® ActiveQ® from Tishcon Corp in the new, stronger 200mg per softgel dosage size – and it is now available in a 90 Count Bottle. Other Ingredients: Medium chain triglycerides, gelatin, ascorbyl palmitate, glycerin, purified water, sunflower lecithin, annatto suspension in sunflower oil and beeswax (white). Free of: milk or milk by-products, egg or egg by-products, fish or fish by-products, shellfish or shellfish by-products, tree nuts, wheat or wheat by-products, peanuts or peanut by-products and soybeans or soy by-products. Directions: Adults: Take one (1) softgel daily with a meal as a dietary supplement or as directed by your healthcare professional. Bio-Q-Sorb® & Active-Q® are registered trademarks of Tishcon Corp.
Kaneka Ubiquinol™ is a trademark of Kaneka Corp.